Carpets samples brought to your door. Quick quote and call us back when you’re ready. We supply and fit general domestic, heavy domestic and commercial ranges. Laminate ranges, suitable for homes to commercial traffic areas. We stock reputable brands such as Balterio, Quick step and Egger. Choose domestic cushion vinyl or robust Luxury vinyl tile (LVT). Have our estimator guide you through the options and suitability. We stock Karndean, Polyfloor, Rhinofloor and many other well known, reputable LVT and vinyl flooring brands. Work carried out throughout Dorset. Carpets Poole Bournemouth. We supply and fit Vinyl, Laminate, carpet tile, and Luxury vinyl tiles. We also offer a sub floor preparation service. We provide a free, no obligation quote to suit all budgets. Bringing our quality flooring samples to your door, enables us to pass our savings on to you. Kingsland Floors are based in Poole, Dorset and boast an expert team of flooring fitters who work in the South of England. We only supply flooring that we stand by. Quality and providing value are key to our business. At Kingsland Carpets we treat each customer on an individual basis. Each having their own requirements and budgets. advise on the best flooring solution for you. From the initial estimating, to our expert fitters installing your carpet/flooring, our aim is to make you’re flooring experience run as smoothly as possible. Quality customer service, superb workmanship, as well as value for money are at the heart of what we do, and are what enable us to continue to be one of the highest ranking carpet suppliers and fitters on checkatrade in the the South. Courteous and helpful throughout. In a short space of time, the carpet was laid and furniture put back in place. I would definitely recommend them. Everything was easy and the price was good. We chose carpet at home and the fitter was really excellent. I have had this company do several jobs for me and so have members of my family. The service they provide is excellent without question. The work was first class Including moving and replacing furniture. The fitter was a professional in all respects an asset to the company. Supply and fit new carpet and underlay in lounge and bedroom, Removing and disposing of old. 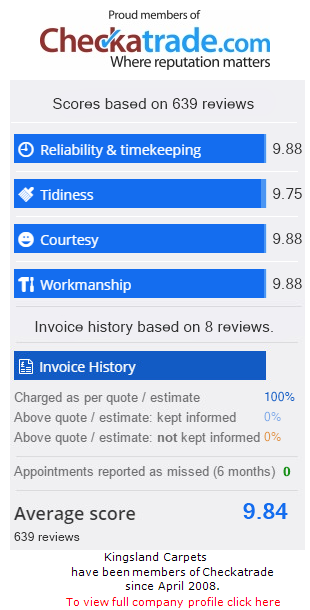 Tom and Joe are always lovely, they’ve done the majority of my carpets in the house over the past 8 years and their prices are always great and they are always polite! Took up vinyl, sorted out wooden boards which had become uneven. Fitted carpet at very short notice. Stairs and landing carpets supplied and fitted. Carpets fitted in living room, dinning room, hall + vinyl on kitchen floor. Most of the house re-carpeted and LVT in the kitchen. Carpets fitted on stairs and in hall. If your News Years resolution is to finally get new flooring in your home but think it won’t dramatically change the look of your room, then check out these before and after pictures. A new flooring can bring a new lease of life into your home. With year round low prices, you can be sure to find a flooring to suit your home as well as your pocket. From cosy carpet to luxurious Laminate, we have styles and colours to suit all decors. Simply call: 01202 779 040 today, to book your free, no obligation quote. Kingsland Carpets, competitively priced, all year round.